Home / News & Events / For the Media / Study Maps Public Opinion About Global Warming Across the U.S.
April 6th, 2015 – (New Haven, CT) — Researchers at Yale and Utah State University have pioneered a new statistical model that accurately estimates public climate change opinion and policy support in all 50 states, 435 Congressional Districts, 3,000+ counties, and cities across the nation, as reported in a newly published article: “Geographic variation in opinions on climate change at state and local scales in the USA” in the peer-reviewed journal Nature Climate Change. 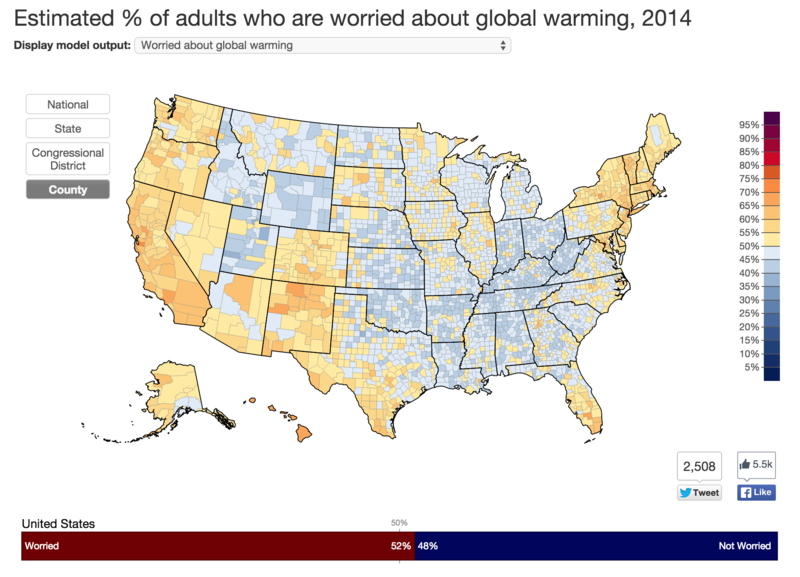 Using these results, the research team also constructed an interactive, online tool called “Yale Climate Opinion Maps” which allows users to explore differences in public opinion in the United States in unprecedented geographic detail, as the county map of public worry about global warming illustrates below. Nationally, 52% of Americans are worried about global warming. But this national number glosses over the geographic diversity in public opinion across the country. Nationally, worry about global warming ranges from an estimated low of 38% of the public in Pickett County, Tennessee to a high of 74% in Washington, D.C. The results also identify important variation within states. For example in Texas, public worry about global warming ranges from a low of 39% in King County to a high of 61% in Travis County. The estimates are derived from a geographic and statistical model using multilevel regression and post-stratification (MRP) on a large national survey dataset (n>13,000), along with demographic and geographic population characteristics. The model estimates were then validated with a variety of techniques, including independent state and city-level surveys. Margin of error calculations indicate that the model is accurate to within +/- 5 percentage points at the state level, +/- 7 percentage points at the congressional district level, and +/-8 percentage points at the county level. To validate the model, the research team conducted separate surveys in four states and two cities and found that the estimates were within +/- 3 percentage points of the independent surveys at the state level and +/- 4 percentage points at the city level. Overall, the accuracy of the model estimates is higher for geographic areas with larger populations. In addition to Dr. Leiserowitz and Dr. Howe, principal investigators included Dr. Jennifer Marlon and Matto Mildenberger of Yale University. The research was funded by the Skoll Global Threats Fund, the Energy Foundation, the 11th Hour Foundation, the Grantham Foundation for the Protection of the Environment, and the V.K. Rasmussen Foundation.